For our Longs Peak excursion, Brad, Shari, Alan, and Joe all opted to head up the Loft Route, as all of them had summited Longs via the Keyhold route before. One of their objectives was to locate the elusive Clark's Arrow, which leads the way from the Homestretch back to the Loft. The last time they had tried to summit via the Loft route, they had failed to find the arrow - but not this time. The entire group was elated to locate it, and Brad offered up to write up a trip report for my website to describe the location of the Arrow, perhaps for others to find of use. 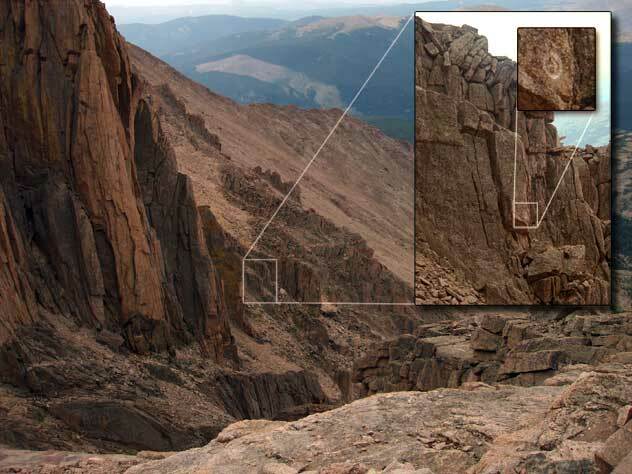 Route finding on the loft route of Longs Peak has always been hit and miss. General directions seem simple enough: Get to the loft, head northwest, downclimb 150 feet, see the arrow, then pick up the home stretch. In practice, this route is easy to lose. From the loft, there are multiple gullies down to the west, and many lead to difficult or dangerous parts of the mountain. While some of these "wrong" routes might get you there eventually, you may end up losing significant time by dropping lower than you need to, to get to the base the cliffs that make passage from the loft to the Homestretch a problem. On our successful journey in August 2006, we found that the initial route from the loft was roughly marked with cairns, until a choice presented itself. We could climb down a steep, loose chute (which looked reasonable as a 150 foot drop), or continue traversing to the NW into what looked like a bad cliff area. It turns out that the second choice was the right answer. The correct 150 foot descent is definitely not a typical scree chute (like the Trough on the Keyhole route, or the climb to the loft from Chasm Lake). The correct route is actually a narrow, surprisingly steep climb. but we did find one section with some loose, larger (200 lbs?) rocks. A few moves are difficult enough that some of your party might feel more comfortable taking off daypacks to keep from snagging. Eventually, the traverse up to the Homestretch comes in to view. The exit point from the climb is fairly obvious, but note that Clark's Arrow will only be useful as confirmation after you have found this access to the traverse, since the very faded arrow is on a rock that faces up toward the Homestretch. I took a GPS fix at the arrow, which seems to plot well on Topo: 40° 15.063' N x 105° 36.844' W, alt 13349 ft.
out of some bad trouble spots. Down climbing at the wrong spot can put you much farther down on the traverse, where there may not be a trail. dicey step along the way. And when you join up with the parade on the Homestretch, you'll probably find yourself much more comfortable with the steep but solid approach to the summit, since you know exactly what lies below in the rather spectacular drop to the floor of the valley. My name is Brian Davis. I'm an engineer / amateur photographer / avid hiker / tinkerer and I live in Denver. This site has a collection of photos, trip reports, and other write-ups that I wanted to share with the world.